I'm home, still jet lagged, pretty miserable but blessed to have had the opportunity to live my dream. I left you on Saturday night after the game. Still can't believe we drew, not the ideal result, but not the worst either. For the second time in 8 months, the All Blacks were shown to be vulnerable, and beatable. And I was there! Anyway, on Sunday I was booked on one final wine tour, on Waiheke Island, about half an hour on the ferry from Auckland. I'd misread my itinerary and almost missed the ferry but my awesome roommate pulled out all the stops and I made it with just a few minutes to spare. I did get a bit of a slagging from our gang, well deserved. The irony was I had been up for hours, but just got chatting and chilling and missed the time. Still, all's well that ends well. We visited three wineries on Waiheke and sampled plenty of wines, including New Zealand's "only prosecco" which was delightful. The weather was mixed but the company was good and it was great to have had something planned when the alternative was probably going to be a very chilled day...or if you were the Scarlets Fan, doing your first bungee jump, from the Auckland bridge! Went for dinner when we got back, to be honest it was the worst meal I had in New Zealand. Not unexpected given we'd opted for a restaurant in the tourist trap that is the Viaduct area, service was poor, food was worse. After dinner we went to say farewell to the first of the Kiwi tourists to depart, they had a silly am flight to Australia so early drinks to say farewell were in order. That done we went on to another farewell gig, the Maori tour (and all the other tours bar us Kiwis) were departing on Monday. Decided to tick another Auckland must off the list early on Monday morning so went up the Sky Tower. You know better than to expect me to have done the Sky Walk or Sky Jump, going up the tower was as adventurous as I got! Spectacular views but I was happy when we finally got in the lift to go down. For anyone visiting Auckland, the souvenir shop at the base of the tower is actually one of the cheapest in Auckland, so some last minute souvenirs and gifts were acquired now that our internal flights were over. Next on the agenda was heading back to the hotel to bid farewell to the Maori tour, and one of the Haka tour groups who were all in our hotel. Many hugs were shared, and in my case, tears were shed. Saying goodbye to the West Cork Mafia, The Murphys from Cork, Rob x2 from NI and of course my minions, that was tough. I've made the mistake here of mentioning names, for of course there were many more memorable people and friends among those tourists, I'd be here all day if I was to name names but I miss them all. Also departing was my wonderful roommate. She'd arrived three weeks before, into an already established Kiwi tour but within hours was part of the family. I couldn't have wished for a better roommate, once again RTI got things right when they suggested we might get on. Must admit I shed another tear when I went back to our room to see all her stuff gone. A huge number of the Kiwi tourists showed up to wave and sing off the departing coaches, and then they were gone. We were now down to our almost original group of just over 30. The starters, and the finishers. Mark from RTI, who'd been with us from the start, had booked a "last supper" dinner for us that night, an excellent call and the perfect finish to our tour. The food didn't disappoint, it truly was stunning, and the all inclusive price included plenty of social beverages too. Following dinner Mark suggested a nearby establishment for a single drink before returning to the hotel bar for the "tour court". 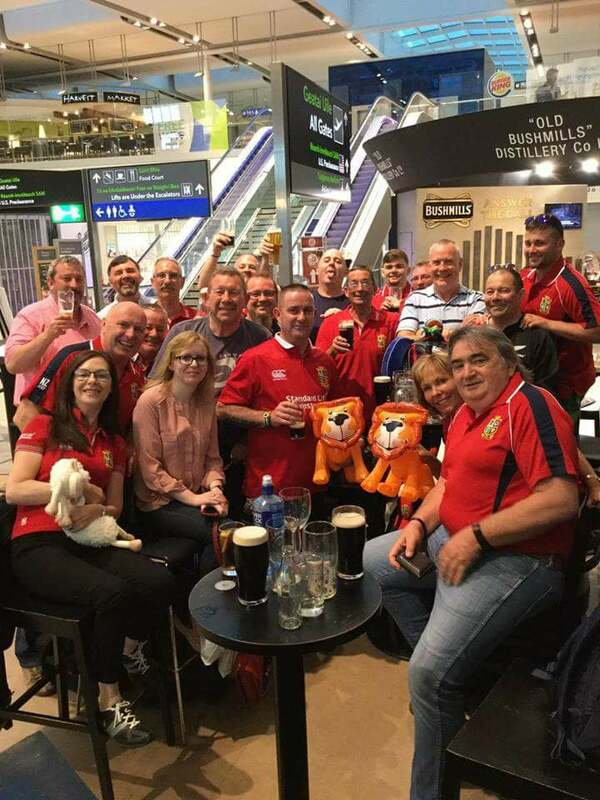 You can imagine our surprise when we arrived into the suggested establishment, to find the majority of the Lions players on a night out. It was surreal. We can forget that the players are humans too and need to let their hair down sometimes, it was strange to see the lads wandering around the bar, chatting amongst themselves and to others. Had a few conversations but we left them to their last night out fairly quickly and headed back to the hotel. Back at the hotel it was strange not to see the lobby bar full of red but we soon remedied that. Charges were levied, "defences" were lodged and fines were paid, but mostly, laughs were had. In the end, everyone paid a fine and this money was added to donations collected, by one of the lovely sisters referred to in a previous blog, for the two schools in Waitete who had given us such a memorable welcome to the rugby club. A sing song followed late into the night, finishing as we started. Tuesday morning dawned all too soon, departure day. We had a 10.30am check out (late for New Zealand believe it or not, they like people up and out sooooooo early!) and our pick up was 1.30pm. Drained, and maybe a little hungover, the majority of the group opted to pass that time on the couches and comfy chairs in the hotel lobby. A few farewells followed, three of our party were heading on to San Francisco for a few days, one was heading home to South Africa, and a few were travelling on a later flight, direct from Auckland to Dubai in business class. You don't need me to tell you there were tears again! Flight wise, we were flying Auckland-Brisbane-Dubai-Dublin, the reverse of our route out. I was expecting the flights to drag but to be honest I barely noticed them. Watched some great films, even if I did make the mistake of choosing some tear inducing true stories, much to the amusement of the Scarlets fan - every time he looked at me I was crying again! Landed in Dublin all too soon. More hugs, more tears, lots of farewells rather than goodbyes. It was so hard to leave behind the people we'd shared over 4,500km on coaches, 10 games and 15 hotel stays with, all over six weeks. But most of all we'd made magical memories and friendships for life. I saved one farewell for Friday morning, and as I waved the Scarlets fan off, the adventure finally ended. If you've made it through all 12 blogs (complete with a few typos, sorry! ), you'll know that I've been living my dream. So many highlights, the welcome at Waitete, the second test win in Wellington, my Hydro Attack shark adventure in Queenstown but overall those long coach journeys where we bonded, sang, did quizzes that hurt our heads, ate sweets and doughnuts, and got to see and love mile after mile of spectacular scenery, but most of all, got to spend time with the Kiwi gang will stay with me forever. Absolute magic! And so I sign off with a few thank yous. To Jeff, for indulging me by publishing these blogs, there's no way I'd have stuck with it if I'd published my own! To Mark and all the team at RTI, thank you for the outstanding service, the tour that went beyond all expectations, great company, not to mention outstanding value for money. To Kevin and Ricky, our amazing coach drivers who kept us entertained and educated as we traversed New Zealand. That's me done, signing off. #mylionsadventure has come to an end, for now. I know I will see my fellow Kiwis again soon, but operation save for #mylionsadventure2021 begins now. No prizes for guessing who I'll be booking with! Thanks to everyone who's read these blogs, for the amazing feedback and the support. Whether you made it to NZ or not, I hope you've managed to live some of the magic with me. And now, natural order will return. We go back to supporting our teams, our players, our countries, only four years until we are as one again. Bring it on!